“Hustle,” Moore said again. “We had it going at the beginning of the season, but we fell off. And now we’re starting to pick it back up. 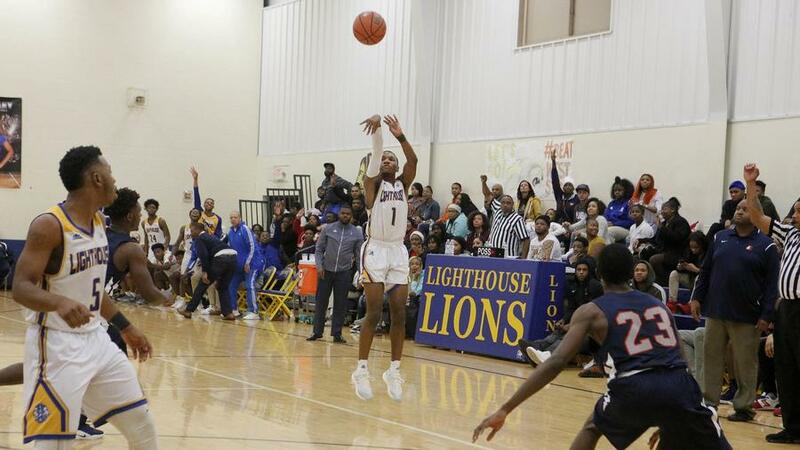 Lighthouse indeed hustled its way to a 57-52 win at home over West Side, overcoming a game-high 24 points from sophomore guard Quimari Peterson. It was all about that hustle for Moore, who watched his team lose 100-84 Wednesday night to 21st Century in the Lions’ first game since Dec. 9. Lighthouse (4-4) took a 32-27 lead over West Side (9-4) just before halftime, thanks to a pair of 3-pointers from Mays in the final minutes of the second quarter. Mays finished with five 3-pointers, crediting teammates Justin Cook and Jordan Higgins with setting up open looks. West Side took a brief lead in the third quarter thanks to an 11-0 run sparked by six points from Peterson. But the Lions roared back to take a 44-42 lead into the fourth and led by as many as eight in the quarter. West Side pulled within three late, but a crucial 3-pointer from Tyrone Funchess kept Lighthouse firmly in front. The Cougars had several opportunities to cut into Lighthouse’s lead, but repeated mistakes doomed those comeback efforts, including four turnovers in the final two minutes of the fourth. West Side coach Chris Buggs said that was a side effect of the inexperienced lineup he has had to use. Buggs said one remedy for that issue is consistent ball movement.